Avocados, Benefits Of An Avocado. Are Avocados Good For Your Heart. Medical research supports the theory that avocados bring many health benefits. As awareness of the benefits of avocados increase, this fruit is today being consumed in various forms in many countries. It is not just Spain and the rest of Europe that is consuming avocados these days. The United States has avocado farms that are actively backed by the avocado related organizations too. In far away Thailand, customers at major supermarkets have started looking around for avocados too. In this report Easyrambler talks about the health benefits that avocados bring. We also explain a popular misunderstanding about the presence of cholestrol in an avocado. It is not uncommon for health and slimming 'experts' to openly claim that an avocado is not good for your heart. Such careless and baseless statements will sadly deprive many people from getting the true benefit of eating an avocado. Make sure that you get the facts, read and understand this brief report. Pass the link on to your friends if you feel that the content is useful. The above picture shows you some unplucked avocados. In the inset is a cut avocado, the yellowish flesh and the rather prominent seed are also visible in the image. When it comes to the benefits of avocados, the strange part is that the uninformed speaker even claims that they are not good for your heart. So let us talk about an avocado and cholestrol. After all it is the cholestrol number that draws much attention on any edible item. Cholestrol is not good for the heart - this is a general statement and most people treat it as the gospel. The fact is that avocados do contain cholestrol BUT, you would be making a big mistake if you stopped eating avocados thinking that they are not good for the heart. Infact avocados are something that your doctor would surely admit are, good for the human heart. So why is this so, despite the fact that an avocado contains cholestrol. Keep reading and discover for yourself. We will try to explain the entire issue in simple and non-technical terms. The idea is to allow a large number of readers to understand the information. You can surely cross check the information provided here with your family doctor. Do keep in mind that none of the information on this website is aimed to be a substitute for professional medical expertise. When you talk about cholestrol and the heart, it is a fact that higher cholestrol numbers are generally a cause for worry. However it is not right to rule out avocados as being bad for the heart just because, they contain cholestrol. Medical experts have managed to study and analyse cholestrol and the facts are interesting. There are basically two types of cholestrol, good cholestrol and bad cholestrol. Without getting lost in medical terminology and jargon we will mention that, HDL is the good type of cholestrol and LDL is the type of cholestrol that needs to be avoided. Avocados do not contain LDL which happens to be the bad cholestrol, this itself is good news. But the much better benefit that an avocado brings is that, it contains HDL which is the good type of cholestrol - this is something that your bod actually needs. This is what we meant by saying that, misunderstandings about cholestrol could deprive you of one of the major health benefits that avocados deliver. Now let us go to one more element that is not so good for your heart, this is sodium. You might have come across doctor recommendations to consume less salt in your food. There is another element potassium that is required by your body, so do not confuse between sodium and potassium. 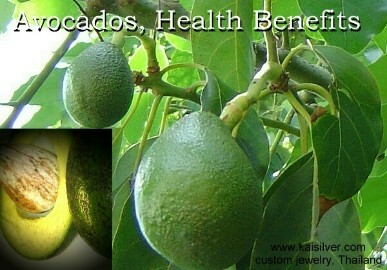 The health benefits of an avocado are once again impressive, they contain potassium but no sodium. We do hope that you now have a better understanding about avocados. You can ofcourse verify the claims made in this report with your family doctor. We do not have any business interest in avocados or any other, food based industry. The information is compiled only to provide useful and interesting knowledge to the general public.